WTO (World Trade Organization) published its "International Trade Statistics 2013" recently. On this publication we can find invaluable information regarding the current status of the global trade. International Trade Statistics is the WTO’s annual compilation of global trade statistics. They have been publishing online since year 2001. As these statistics are collected and published by WTO, they are accepted as the most reliable international trade data by most of the organizations. Today I would like to introduce you 10 biggest importing countries throughout world in year 2012 according to WTO statistics. Which transport documents can be issued “to order”? Exporters and importers use various types of shipping documents in international trade such as financial documents, insurance documents, inspection documents, transport documents, legal documents etc. Daily life in trade practice shows us that foreign trade professionals could not use especially transport documents properly. Exporters and importers should learn the specifications of each transport document in order to prevent any mistakes. 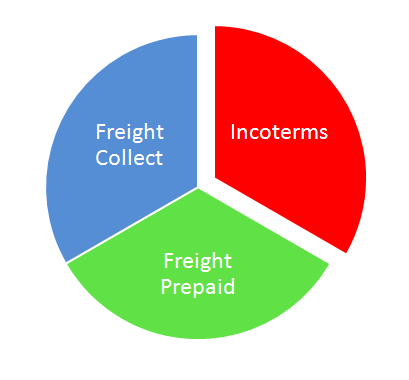 Incoterms is a short form of International Commercial Terms. They are published by ICC’s Commercial Law and Practice Commission. Current version of Incoterms is called Incoterms 2010 which has been in force since 01.January.2011. Incoterms rules are published by ICC in order to define buyers and sellers obligations, costs and risks associated with the transportation and delivery of goods in a very clear way with a global scale. Incoterms rules can only be applied to transactions in which tangible goods are bought or sold. You cannot use Incoterms to sales of intangible goods. 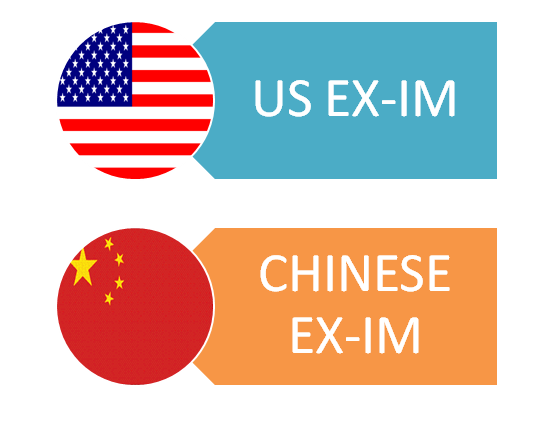 Incoterms rules can be used both international and domestic sales. Various types of transport documents used in international trade. Bill of lading is a transport document which is used in sea shipments. A bill of lading is not only a receipt for the delivery of goods, but also contains a contract of carriage. the consignor delivers the merchandise to the carrier in good order. 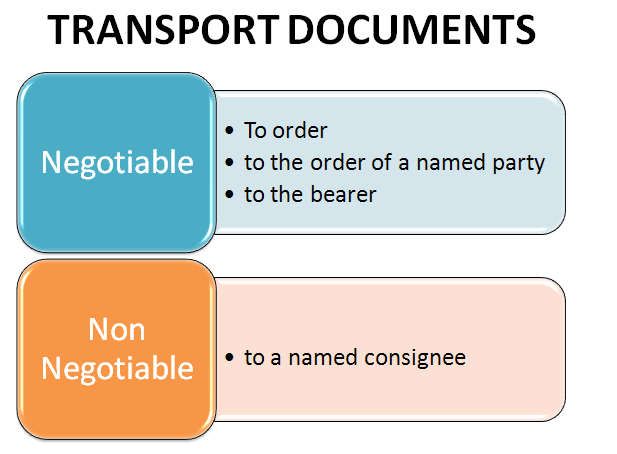 the terms of the carriage is accepted by carrier as indicated on the face of the document. in a traditional form (negotiable bill of lading) consignor can pass title of goods to another party by means of endorsement or delivery. In addition to these information, bill of lading indicates by whom the freight charges will be paid. 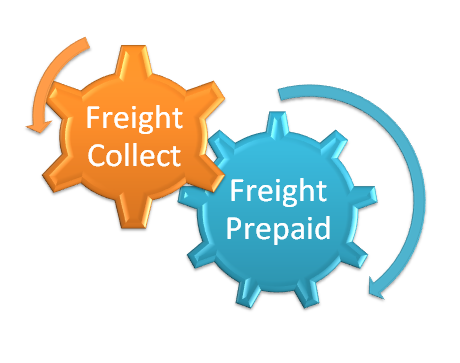 “Freight Collect” and “Freight Prepaid” are the terms that used in this regard. 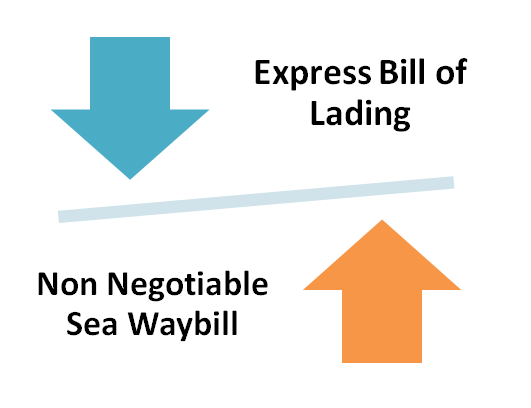 Are there any differences between express bills of lading vs. non-negotiable sea waybills? We can see that international logistics sector is no shy assigning new names to the transport documents. ICC which is the short form of International Chamber of Commerce have noticed this reality and add phrases to its rules books such as UCP 600, ISBP in an effect that the name of the transport document is not a point of consideration. Let us have a look at couple of these expressions from UCP 600. What are the differences between bills of lading vs. non-negotiable bills of lading? Bill of lading is a transport document which is used in international port to port sea shipments. This transport document has a long history as it can be accepted as a first transport document used in international shipments. Traditional bill of lading was developed before the industrial revolution had been taken place. At those times vessels were slow and information options were very limited comparing our current technology. Bill of lading has been evolved over the years in order to respond the changing business environment. Non negotiable bill of lading is one of the end results of this evolution. How to send samples via international courier without having custom clearance problems? TNT, DHL, FedEx and UPS are the well known global air courier companies. They carry lots of international cargo contains not only just shipment documents but also small parcels every day from one country to another. They are fast, secure and reliable service providers for international companies. Sometimes samples held by the customs and unexpected custom clearance costs will be paid by the exporters or the importers. Negative effects of this problem could lead to some harmful consequences on these companies. 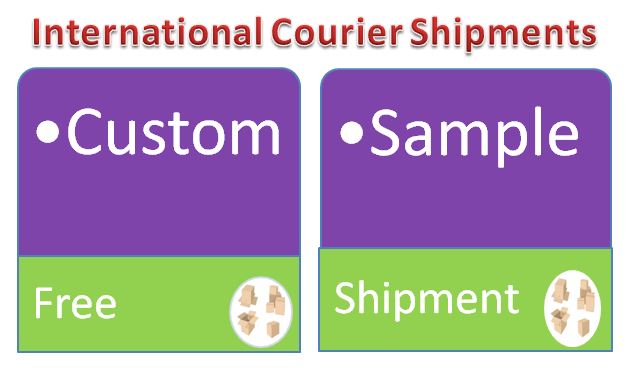 On this article I would like to write about how to make sample shipments via courier companies so that the parcels will not be held by the customs. Exporters and importers would like to do their business as efficient as possible in today’s global economy in order to be staying competitive and profitable. International logistics companies have long ago understood this situation and took necessary steps. Growing freight forwarders presence in global transportation sector was the ultimate response. Freight forwarders’ role is very simple in an international transaction where only single mode of transport is used. They buy bulk spaces from the transport companies and sell them to exporters and importers in small quantities. 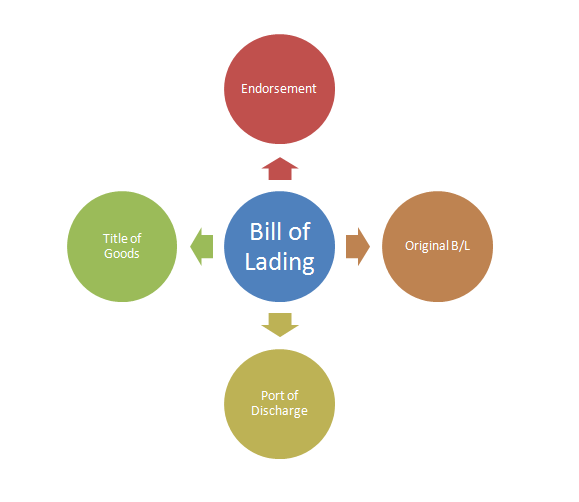 If a negotiable bill of lading has been issed in an international trade transaction, then importers have to present to the carrier’s agents at the port of discharge one original copy of bill of lading in order to receive the goods. If buyers could not present this original bill of lading than the shipper may have to fill a document called letter of indemnity to have the goods released without surrender of the original bill of lading. 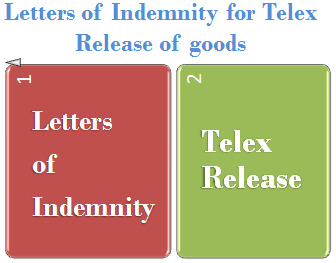 This article explains the issuance process of letter of indemnity and telex release of goods. In general countries make the majority of their international trade with their close neighbors. For example the USA makes 29% percent of its total exports to Canada and Mexico while 27% of its total imports from these two close neighboring countries. Similarly the UK makes 25% percent of its total exports to Germany, France and Netherlands while 26% of its total imports from these three close neighboring countries. These examples can be extended. Regional Trade Agreements have been set up between close countries with the aim of increasing trade between member states by reducing or eliminating tariffs, quotas and other non-tariff barriers. WTO (World Trade Organization) published its International Trade Statistics 2013 recently. On this publication we can find invaluable information regarding the current status global trade. They have been published online since year 2001. As these statistics are collected by WTO they are the best available source in terms of reliability. Important Note : Figures show only merchandise exports excluding exports of services. 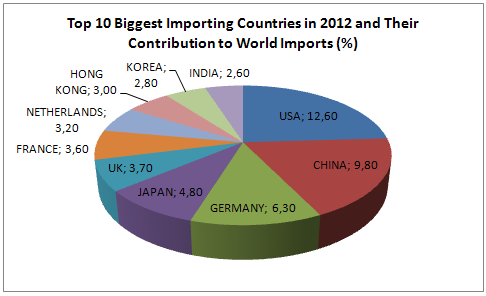 Al data gathered from International Trade Statistics 2013 published by WTO (World Trade Organization). What does non-tariff barrier mean in international trade? Contemporary Economic Development Strategies in today’s global business system encourage countries to do more exports and fewer imports to achieve a sustainable development. Especially less developed countries that could not reach adequate export levels try to limit their imports in an aggressive ways. As tariffs have been decreased by WTO agreements all around the world now the only choice left for these kinds of countries that can be used to restrict the import is Non-tariff barriers (NTB). If you would like to be permanent and successful in international trade then you need to learn payment methods very well. Profit margins in a typical foreign trade transaction is limited due to high competition but risks are high. One mistake could lead to your bankruptcy. Legal Issues: In international business your customer will be located in a different legal area. This makes almost impossible to recover your losses through legal ways. Once you make the payment as an importer you cannot get back to your money against a fraudulent exporter. On the other hand if you trust your buyer and make the shipment without having paid your chances of recovering your payment is very limited against a fraudulent importer. As a result you need to learn and practice well payment methods either you are an importer or an exporter. Commercial Issues: You cannot seal the deal every transaction with simple payments such as cash in advance or open account. You may have to use letters of credit or documentary collections as conditions dictates. The better you can use payment methods in international trade the more likely you can complete successful deals. Better Career Chances: Much of the sales stuff does not understand from complicated payment types especially sound usage of letters of credit is very rare. If you can learn and practice letters of credit you will be getting ahead of the competition for better job opportunities.